SAN FRANCISCO--(BUSINESS WIRE)--Jul. 16, 2014-- Visa Inc. (NYSE:V), the global leader in payments, today announced the opening of One Market, a 112,000 square foot innovation center and office space at One Market Street in San Francisco. The move provides Visa technologists, clients, partners and the Bay Area tech community an innovative space to jointly develop the next generation of commerce applications. According to ABI Research, more than 30 billion devices will be wirelessly connected to the “Internet of Things” by 20201. Additionally, a recent survey conducted by the Pew Research Center found that 83 percent of technology experts and engaged Internet users agreed that the Internet of Things, and embedded, wearable computing, will have widespread and beneficial effects on people, businesses and communities by 20252. Visa’s new One Market office and innovation center will be home to more than 500 Visa employees, including technology experts and developers whose mission will be to ensure that every Internet connected device, appliance or wearable computer, can become a secure place for commerce. The centerpiece of One Market will be an innovation center designed to provide an immersive experience for clients and partners, where they can interact with Visa subject-matter experts, and explore new products and technologies that advance the payment experience in areas such as mobile, security and cloud-based technologies. 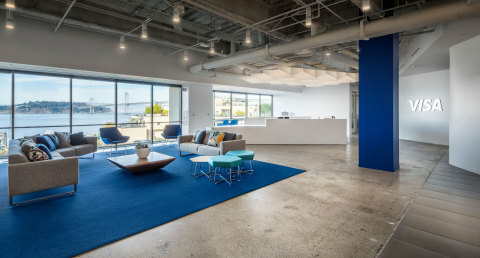 The space has been designed to encourage dynamic interaction and real-time experimentation, and is expected to attract Bay Area technology talent who want to develop the next generation of commerce solutions by working with the industry leader in payments. Today, in celebration of the grand opening of One Market, Visa is hosting clients, merchants, technology partners and press from around the globe to showcase innovations relevant to the future of commerce. As part of the event, Visa will launch a new online payment service called Visa Checkout, which makes purchases from a desktop, mobile device or from within a mobile app intuitive and simple. Please join us via web cast to view the event live.